Avis Indie Art was established by the owner and artist, Mark Avis, to produce limited edition original sculpture. 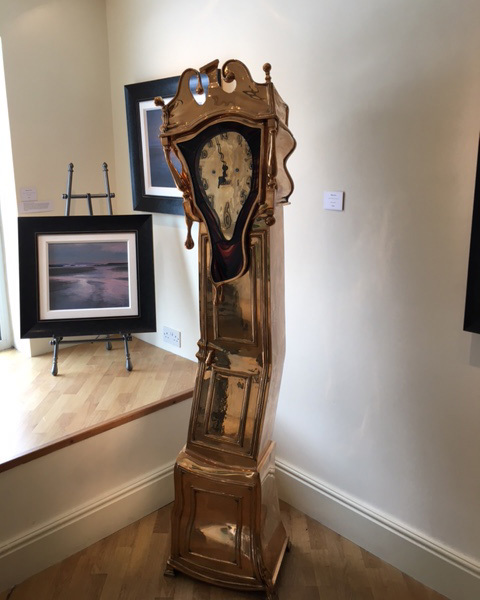 Based in his home town in Nottinghamshire, Mark not only defines the concept of each piece, he also hand makes every design, meticulously bringing to life his intricate ideas into stunning pieces of sculpture. This is a worldwide limited edition of 100 available in polished aluminium, pewter finish aluminium, and polished bronze. 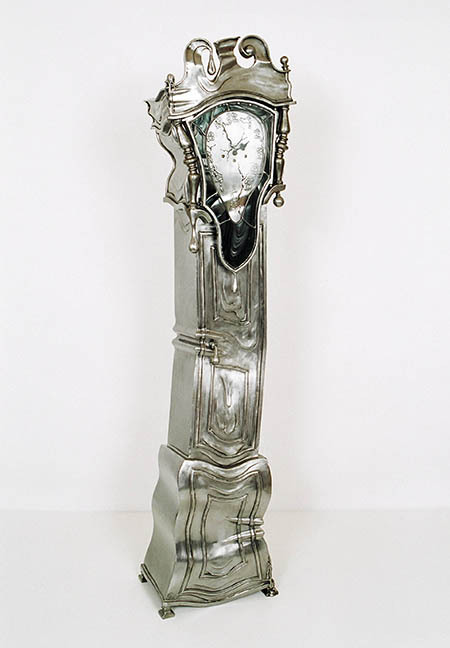 This sculptural clock views time as a concept, the measurement of time only being a concept to man, as from birth time is set against us. This is illustrated by Gaia’s dial gradually dripping away. The ‘drip’ and ‘drop’ on the door of Gaia, symbolise the ‘tick’ and ‘tock’ as time drips away, with Gaia’s dial being pulled down to the earth by the gravity of time. The original Gaia was designed and handmade completely by the artist, taking many months of dedication to complete. 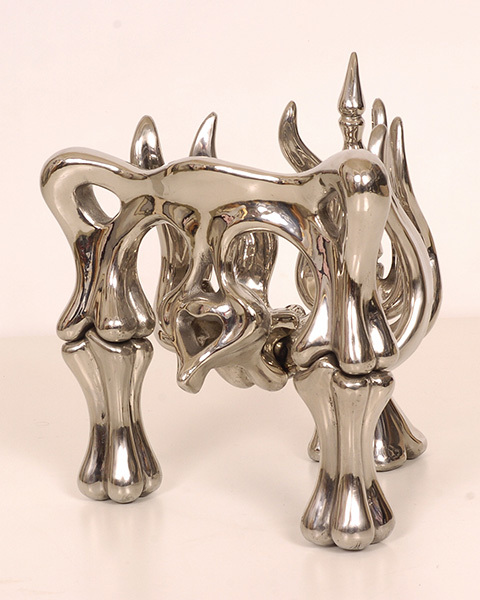 From this original, a sandcast pattern was made to enable the production of the limited-edition pieces. The casting process takes several weeks to complete, with each element of Gaia being meticulously handmade. Once cast, Gaia is hand polished to its beautiful mirror finish by artisan craftsmen or finished in a pewter finish if preferred. Handmade glass is selected to fit the curves of Gaia’s door, and individually crafted for each clock using a highly skilled glass artist. The clock movement is then hand fitted and monitored to ensure timing accuracy. Each limited edition is hand finished by the artist, and a unique serial stamp is added. A certificate of authenticity is provided with each piece, hand signed by the artist. This is a worldwide limited edition of 100. 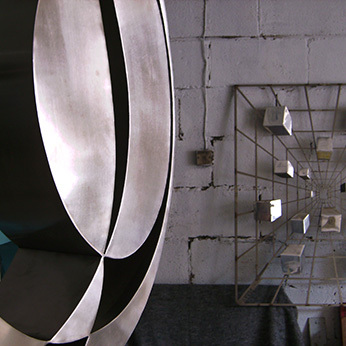 This piece is a wall hanging sculpture, which took 12 months of development. The lines simulate time stretched back through my imagination and the squares represent a journey and convey a sense of movement depicting our own journey through life. As time is the fourth dimension it can be measured, so the lines are based on precise graphical calculations. 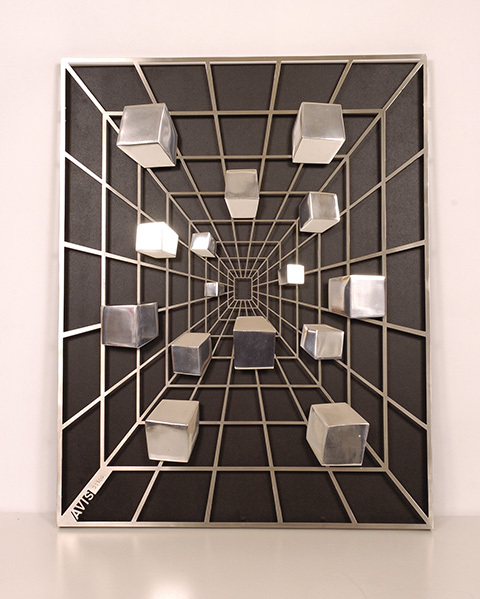 When viewed, each piece reacts optically to give an illusion of depth and movement. The black and silver design produces visual oscillations due to the optical techniques used. 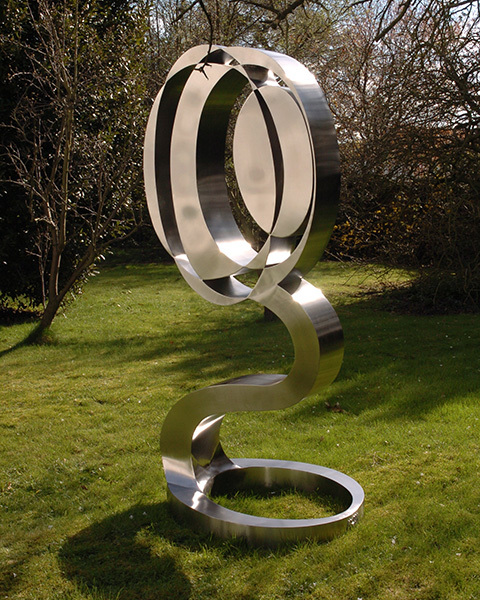 This is a worldwide limited edition of 3 in stainless steel. Could also be offered in bronze as a limited edition. Inspired by the song “British Legion” by Kasabian, this piece can be viewed from many angles. Snare began its life as a series of drawings, depicting five rings, which were cut and overlapped with each other to establish the 2D effect on paper. These drawings were translated into 3D using sheets of stainless steel. Where the lines cut into each other, Op Art techniques were used to infill the negative space. These five rings simulate the snare, which when viewed from different angles can look totally flat or can unexpectedly seem to bulge towards you and twist on its axis due to the optical effects. The base it stands on it less abstract. It is a snare laid flat on the ground with the sculpture balancing on top and bent backwards, ready to be sprung. 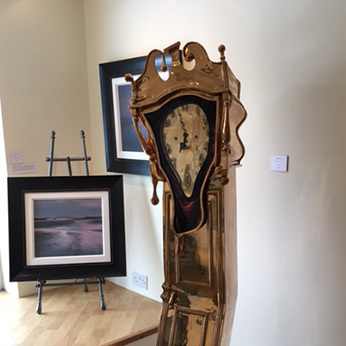 This is a worldwide limited edition of 48, available in polished stainless steel or solid bronze. 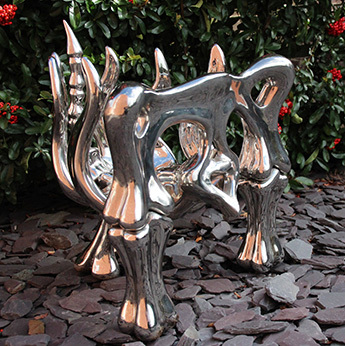 The 'Dog Grate' is a free standing sculptural 'fire' grate, based on the forms of the pelvis, legs, rib cage and tail of a dog - in the style of bones. With the tips of the ribs suggesting the flickering of flames, the idea behind it is to symbolise a fossilised sculpture and the use of fossil fuels impacting global warming.. This was a limited edition of 100 - this edition is completely sold out.